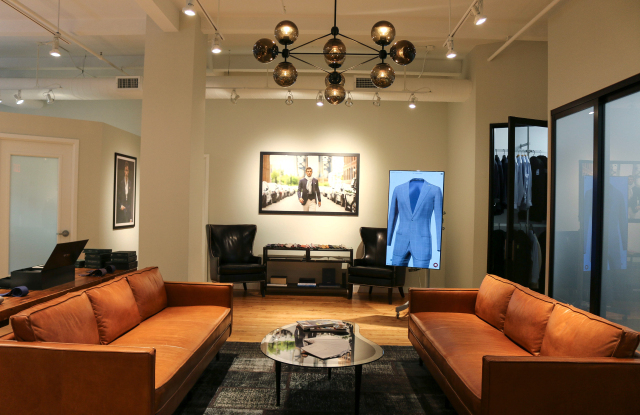 create and visualize custom suits, blazers and pants in 3-D form. The studio is available through the web and on all mobile devices at the company’s web site. He said a touchscreen will also be available inside Bloomingdale’s. Ballay said the idea for the firm came from trying to figure out how to scale a local tailor. The core customer is between ages 28 and 45. The customer repeat rate is 60 percent, Ballay said. The company has eight global showrooms, an e-commerce platform and now the virtual studio. The showrooms are in New York; San Francisco; Houston and Austin, Tex. ; Chicago; Dallas; Washington, D.C.,and Dubai, where the business first launched. The virtual studio allows the customer to navigate through a 55-inch touchscreen different iterations of options, whether its fabrication, overall styling, lapel style, pocket type, lining options, as well as the ability to tweak buttons, belt loops and trouser cuffs. Average price range is $795 for a suit, but that can go to $3,000 for high-end bells and whistles, and for a select fabric group of limited runs that’s only available in the showrooms, the suit can go as high as $8,000. Ballay said the company is looking at Series B options. It counts Traub Capital and Under Armour ceo Kevin Plank as investors.